So, there was this one time . . .
How'd you get that limp? Are you limping? Why do you walk with a limp? These questions came at him frequently when he was young and the people asking them were also young and lacking in tack. They came less frequently in his adult life. People either chose not to ask, made their own silent assumptions, or simply didn't care. But he was sure that they noticed. Everyone could notice. Heck, he noticed every time he'd walk alongside a storefront window. His head automatically swiveled to check his gait, to note that familiar hitch in his step and, for just the few seconds of his travels past that window . . . he would try to smooth it out. That was his newest answer--ready made for someone who wanted to ask the question. "I got injured wrestling a bear." The great part of this answer is that, if it was summertime and he was wearing shorts, this could also explain the surgery scars that were on the back of both legs, running from above the kneecaps to an inch or so below. And if he was wearing sandals, you could see more scars on his left foot, on the ankle. If he was at the pool and barefoot, even more scars were exposed on the tops of the foot and on either side of the ankle. A Frankenfoot, he might eventually think to call it if in an extended conversation and he felt the conversation was getting too deep and a relaxing joke was necessary. Even though the surgeries had been decades ago, he believed the scars were still quite visible. (Though he knew, in fact, that they were not.) But his memories of those first post-operative days , when the scarred flesh was still raw and tender. In those days, and within his mind, the scars were angry, bright, and really in your face. The real reason he had the scars (and the limp) was much less interesting that bear wrestling. The reason was not of his choosing, beyond his control, and a random fact of life. So, if he was going to be singled out for something he couldn't hide, it was best to make up a good explanation for why he was that way. Let's have some fun, I guess. When he was younger, answering the question of the limp was traumatic. It got him upset when people noticed. (No young kid wants to be different.) Back then he told the truth. The boring, ordinary truth. But it was cumbersome and sometimes involved big words that not everyone understood. And really, most people just though he twisted an ankle playing softball the previous weekend. When he started telling them the boring truth, their eyes glazed over because it can just be Too Much. (They were just shootin' the breeze, filling the conversational dead space.) So, he would come up with a story that grabs their attention and makes them want to know more. He noticed that when he said bear wrestling there was a light in the eyes. And then he would just keep spinning the tale out. How far could he push? Are they going to believe him at all? Halfway? Could he take them to the edge of idiocy before they bail? Could he hold himself together long enough to get them there or was he going to crack? In short, they've already got his number. So, yeah . 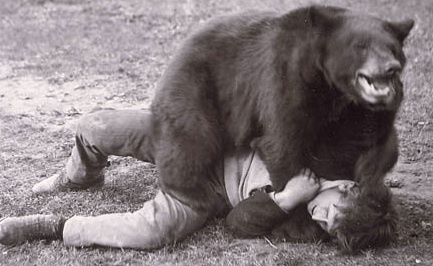 . . bear wrestling. But, after a while, he would need to change it up to a new story. I wonder what it would be next time?